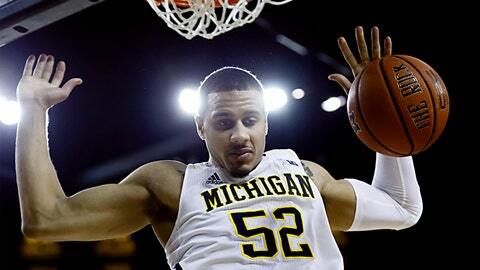 Michigan's Jordan Morgan had 11 points and six rebounds in the win over Purdue. ANN ARBOR, Mich. (AP) — After an uncharacteristically sloppy game for the Big Ten leaders, Michigan coach John Beilein was relieved to have won. "It’s going to be a battle all year long," Beilein said. "We’re pleased that we could keep our head above water tonight." Caris LeVert had 14 points and a career-high 11 rebounds for his first career double-double, and No. 10 Michigan beat Purdue 75-66 on Thursday night, extending its winning streak to 10. The Wolverines were outrebounded and turned the ball over 16 times, but their brilliant shooting can cover up a lot of problems. Nik Stauskas scored 16 points and Derrick Walton added 14 for Michigan (16-4, 8-0), which shot 61 percent from the field against a Purdue team that had held its previous five opponents under 42. The Wolverines were also 7 of 13 from 3-point range. "We didn’t really like the turnovers," LeVert said. "We had a lot of them tonight, but we just wanted to make up the plays that we messed up on." Michigan was coming off three straight wins over top-10 teams, and there was no letdown at home against Purdue. LeVert has been one of the Big Ten’s most improved players this season, and the wiry sophomore showed he can mix it up around the basket against Purdue. After playing 39 minutes in Saturday’s win at Michigan State — and finishing with eight rebounds to match what was then his career high — he went right back to work Thursday. The 6-foot-6 LeVert went 5 of 11 from the field, and in addition to leading both teams in rebounding, he also added two assists, two blocks and three steals. Walton, meanwhile, has looked increasingly comfortable after a quiet start to his freshman season. The Michigan point guard went 6 of 7 from the field against Purdue, helping take some of the pressure off Stauskas. "The two pull-up jump shots he had, we didn’t see that even earlier in practice," Beilein said. "Those were shots that a No. 3 used to hit last year for us." No. 3, of course, was Trey Burke, the national player of the year who left Michigan early to go to the NBA. Walton has replaced him, and as his confidence grows, so does Michigan’s. The Wolverines turned the ball over eight times in the first half, but the game shifted a bit shortly before halftime. A lane violation wiped out a chance for Purdue to close the gap at the free-throw line, and Walton followed with a driving layup in the final seconds to give Michigan a 37-29 lead at the break. "That was my fault on both ends," Hammons said. "I jumped the free throw, and then I thought I could stop the ball at the end, and I let him get by me. That’s all on me." Michigan made nine of its first 11 shots in the second half and led 56-41 after a jumper by Walton. It was 60-52 after Hammons dunked on Stauskas and drew a foul with 8:59 to play, but he missed the free throw and Michigan’s Zak Irvin connected from 3-point range at the other end. Purdue had been 78-4 under coach Matt Painter when finishing with more rebounds and fewer turnovers than the opponent. But the Boilermakers did both those things Thursday and lost anyway. Michigan’s sharp shooting was simply too much to overcome. Bryson Scott had 12 points for the Purdue and Ronnie Johnson added 11. Jordan Morgan had 11 points and six rebounds for Michigan — another impressive performance for the senior who has helped the Wolverines withstand the loss of star big man Mitch McGary, who is out indefinitely with a back injury.